You'd be forgiven for thinking that the location for this stunning styled shoot was somewhere in the south of France, when it was, in fact, less than an hour from central London at the beautiful Lavender Fields near Hitchin. Styled by Wedding Planner Katie Stocks, from The Events Designers, and shot by the incredibly talented Eva Tarnok, a whole team of wonderful wedding experts collaborated to produce this beautiful collection of images. 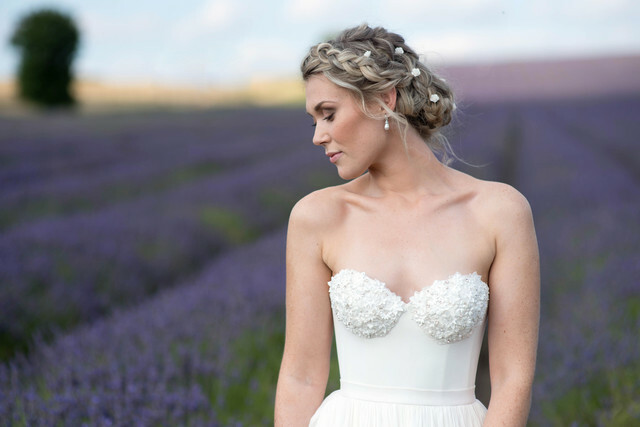 The aim of this gorgeous styled shoot was to create a very natural, timeless and feminine ambience and what better location than the stunning Lavender Fields. The shoot was set in the heart of Ickleford, Hitchin overlooking Herefordshire fields and valleys. The shoot was very light bursting with beams of lilac and greenery creating a vibrancy of colours and different textures. Choosing lilac as the main colour, Katie used both lighter and darker shades to create depth. Utilising colours of lavender and cream created a beautiful romantic touch. Soft accents of lavender colour complimented the lavender fragrance which is simply breathtaking. The picnic area set for two was designed and draped with exquisite luxury hand dyed silk from Pom Pom Blossom. Katie wanted to create a relaxed yet beautiful picnic with delicate red-wine, french breads and cheeses.